The legal team met in Atlanta at Wood’s offices. The lawyers said they would be reviewing all false accusations and threats made against the high school student. “We fully expect that a multitude of civil lawsuits will be filed and aggressively pursued. We recognize that justice for Nick will not be achieved quickly, but we are dedicated to achieving it for this young man regardless of time or expense,” they said. Wood said later on Jan. 25, that he and McMurty delivered a preservation of evidence demand to Covington Bishop Roger Foys, who is in charge of the Catholic school. A day after the demand was sent, the bishop apologized to Sandmann for releasing a statement based on news stories about an edited video that lacked context. The video showed Nathan Phillips, the Native American activist, banging on a drum in the face of Sandmann. News stories relied heavily on interviews with Phillips, who lied about being a Vietnam veteran and lied about what happened in Washington. 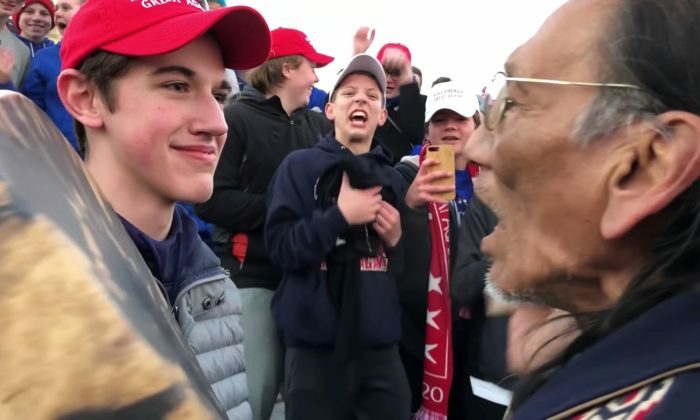 When the full video of the incident emerged it showed how the Covington students were subjected to a torrent of verbal abuse by a group of Black Hebrew Israelites and how Phillips chose to target the students as opposed to going to the Lincoln Memorial, which he originally claimed was his intent. Instead of the students surrounding him and not letting him pass, the video showed him purposefully making his way towards the students until he came face-to-face with Sandmann. Then, while a member of his group shouted at the students that they “stole our lands” and should “go back to Europe,” Phillips chanted while banging the drum. The false portrayal of the situation prompted a number of activists, analysts, and reporters to apologize and admit they hadn’t done due diligence in processing the situation. Another lawyer, Robert Barnes, told The Epoch Times that he plans to sue some celebrities and media personalities for libel against the students, whom he represents.